I think one of the most exciting moments I have as a blogger is when I receive an email from a reader that made one of my patterns or tutorials. I LOVE seeing the photos and hearing the story behind the quilt. I thought I would feature a few here. The first quilt in the above photo is by my friend Kelly. I can't tell you how flattered I was when she cut into her Katie Jump Rope stash to make the Kaleidoscopic Kites Quilt Pattern. The second quilt you see above was a really fun surprise. Last May I received an email from Lynne Miller of the St. Louis Modern Quilt Guild. Fabric designer Laura Gunn asked the guild to make a quilt for Quilt Market using her new Painter's Canvas line. Lynne chose my Lemon Squares pattern. She did such a great job, it is really stunning. And I was honored to even have a little tiny piece of me at Quilt Market...talk about exciting! The third quilt in the top photo is by Shannon and is also the Kaleidoscopic Kites Quilt Pattern. This was Shannon's first quilt where she followed a pattern from start to finish. 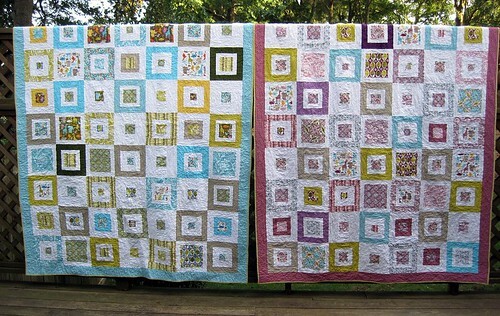 Her fabric selection and quilting is just beautiful. Last but certainly not least are these twin beauties by Katie of Katie's Corner. If you have made a quilt from one of my patterns, or do so in the future, I would love to see it.